or select an atom from the Periodic Table dialog. The chosen atom appears on the tip of the mouse cursor and you can place it on the canvas with a left-click as many times as you like. Deuterium and Tritium symbols (D and T, respectively) are available via keyboard buttons. Query atoms can be placed onto the canvas by keyboard shortcut or via their combo button on the Atoms toolbar. Pseudo atoms are also available among these combo buttons. Star atom (*) can be placed onto the canvas by clicking its button on the Atoms toolbar. All types of atoms mentioned above are also available from the Atom properties dialog. Choose the Atom list button on the lower left corner in the Periodic table dialog. The selected button is indicated by green, and an OK button appears on the bottom of the dialog. Select the atoms you would like to have in your list. The selected atoms are indicated in grey. The dialog closes and the selected elements of the atom list appear on the tip of the mouse cursor. Click the Pseudo atom button in the Query atom combo-box on the Atom Toolbar. Fill the text field in the Pseudo atom dialog window. The Pseudo atom will appear on the tip of the mouse cursor. Metallic elements are added to the canvas in zero oxidation state. CPK coloring and monochrome display of the atoms are also possible. Atoms on the canvas can be replaced by inserting a new atom to the same place as the old one. If you select several atoms at the same time, you can also change them simultaneously using the most frequently used atom buttons, the keyboard or the Periodic System. Setting charge is also possible by hovering over the atom then typing - or + on the Numeric keypad. 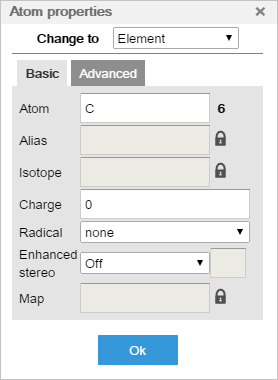 In the Atom properties dialog you can set the values of atomic charges, isotopes, monovalent radicals, enhanced stereo specifications, atom maps, aliases in the Basic Tab and query properties in the Advanced Panel. For details, please, check the Atom properties dialog page. Right-click on the atom in question or select more atoms and right-click on one of the selected atoms, then choose Atom properties from the pop-up menu. You can delete atoms from the canvas by using the Delete tool: clicking on the atom or dragging until a red rectangle appears around the structure. It is also possible to select the atom(s) with one of the selection tools first, and click the Delete tool or press the Delete button on the keyboard.